G-NG's Emma Woods and LRHS's Lauren Jakobs clash. 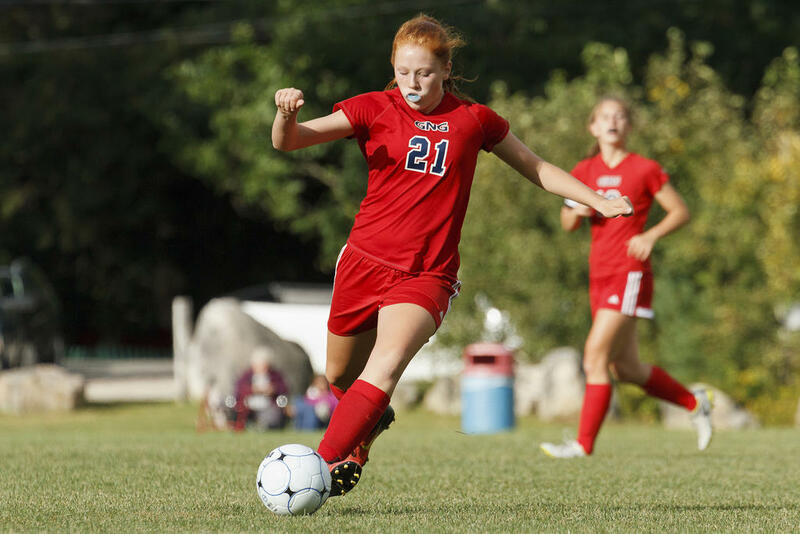 NAPLES – Lake Region took an early lead against visiting Gray-New Gloucester on Friday afternoon, Sept. 8 – but the Patriots would ultimately surge to victory: Alexa Thayer posted a pair of determined, second-half goals to elevate her girls over the Lakers 2-1 in the end. Rain actually interrupted the game barely two minutes in; only after a lengthy delay did play resume. When that happened, G-NG seized initial control of the attack, with LRHS relying for their offensive chances on a few, scattered forays up the field. In due course, however, the Lakers settled in; they balanced the action out and, roughly 13 minutes in, capitalized: A Neva Leavitt corner kick curled prettily inward toward Patriots keeper Chelsea Adams – who made contact with the ball, but couldn’t quite keep her hands on it, and unfortunately deflected it in. Both squads turned some near-misses as the remainder of the opening half unfolded, but neither could convert. 1-0 at the break. Lake Region applied heavy pressure to begin the downhill 40 minutes, but the scoring would all belong to G-NG. Thayer – who all afternoon had knifed up and down the right side of the field, firing off shots and cross-passes and in general threatening to carve up the Lakers’ defense – battled for successful rebounds on two separate occasions, thrusting her girls into the lead. Thayer’s first strike came with 18:56 remaining; after that, play rolled up and down the field, and the teams’ keepers – Adams for G-NG and Madison Rock for LRHS – traded spectacular saves around the 13-minute mark. In the waning moments – with maybe 3:00 to play – Rock turned another great save, this one a diving deflection on a G-NG blast from in close. But Rock, laid out on the ground after the effort, couldn’t get to her feet in time to also repel Thayer’s follow-up shot, which bulged the twine and secured the Patriots their 2-1 W.
G-NG moves to 1-2 on the season; the Patriots began their trek this autumn with a 2-0 loss to Yarmouth and a 4-0 loss to Cape. They host Greely on Sept. 12, travel to Freeport on the 14th and welcome Sacopee Valley on the 16th. 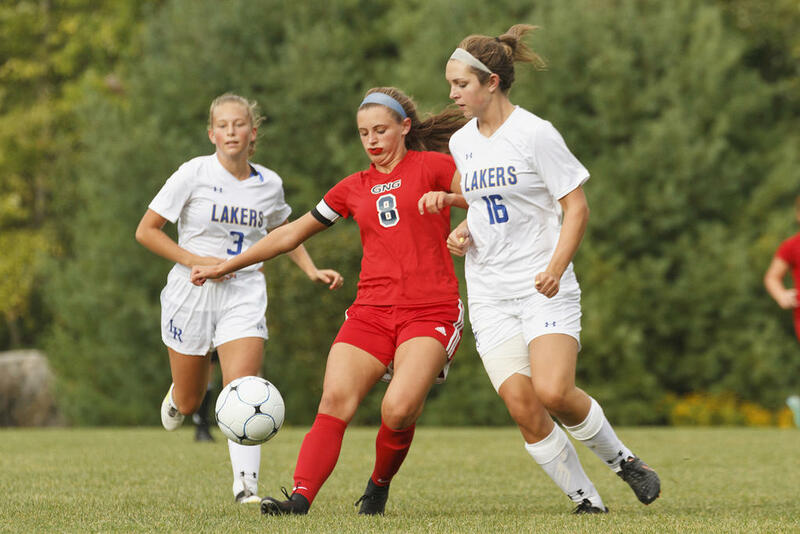 Lake Region slips to 0-2; the Lakers fell 2-1 to Wells back on Sept. 1. They drop in on Poland on the 13th, then host Freeport three days later. G-NG’s Emma Woods and LRHS’s Lauren Jakobs clash. Neva Leavitt settles a ball for LRHS. Patriot Kelsey Randall heads an incoming ball. Eliza Hotham cuts upfield for Gray-New Gloucester vs. Lake Region. Patriot Laurel Thomas and Laker Maraia Nason collide in pursuit of an airborne ball. Laker McKenzie Siebert chases as Patriot Madysen West pushes forward with the ball. Alexa Thayer posted both of G-NG’s points against Lake Region on Friday.